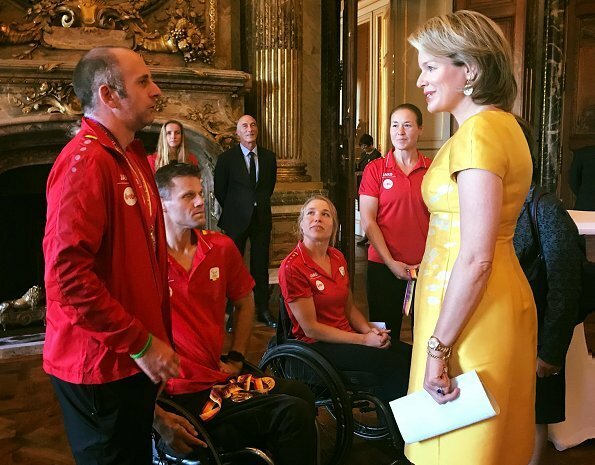 On September 27, 2018, Belgian King Philippe and Queen Mathilde held a reception at the Royal Palace to congratulate the athletes that won medals in the first eight months of 2018 in European Championships, Olympics and Paralympics. 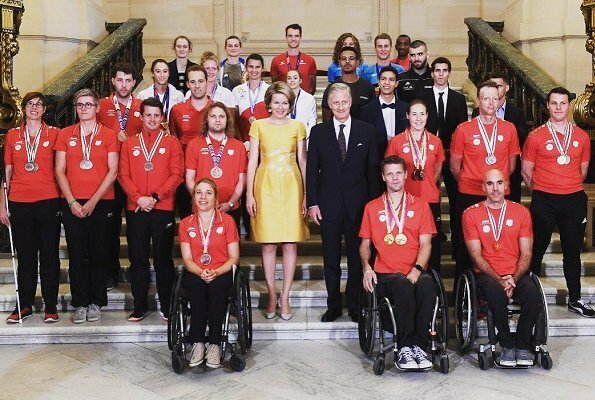 Medal winner athletes, their coaches and a delegation from Belgian Olympic Committee and Belgian Paralympic Committee were invited to the reception. 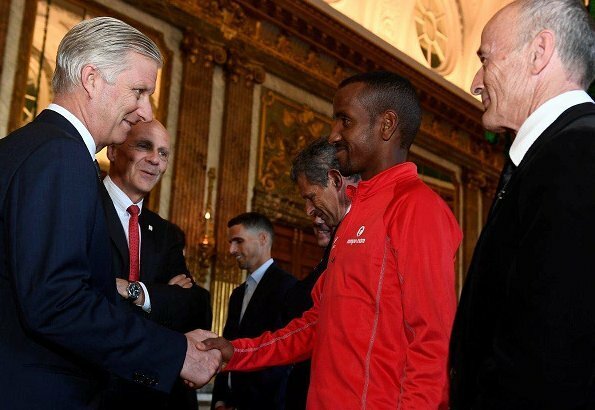 I like Queen Mathildes hair and her warmhearted smile and Charme. It seems to me that she has gained a bit of weight around her middle like most of the women (if they haven't a strictly diet) around age of midfourty and fifty. I find this comment about her weight completely unnecessary. It has become increasingly obvious the Mathilde may have a skeletal issue. Many past photos have shown this and the first photo makes it apparent that her posture is worse. She is a lovely woman and I hope it is nothing but fatigue. This makes clothes fitting difficult and may explain some of our criticisms of her wardrobe. @ Hero, I do hope that she has not any health problems, back problems, I actually think it is the illfitting too tight dress that makes for the bad posture. 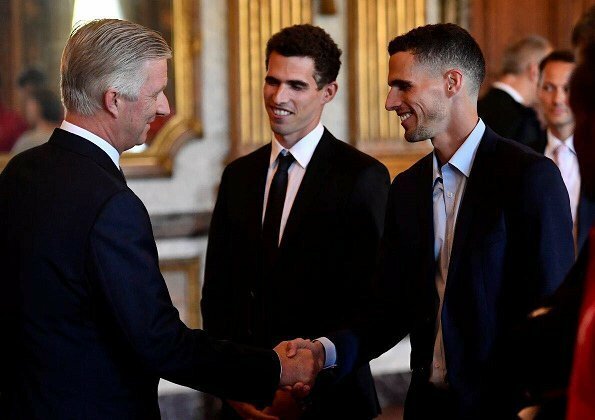 Mathilde, looks very nice in this dress. This dress fits her so nicely! She seems to be the champion of odd colors in clothing but they usually look lovely on her. It takes courage to wear some of the things she chooses. In almost all of the day-dresses the fabric looks very stiff. Now I wonder if it is the fabric or an interlining that makes the stiffness. I guess she doesn't love soft, flowing outfits. It is because she is wearing Natan, who constantly uses this type of fabric. Maybe she thinks this fabric makes her day dresses look more formal. Nice! With this yellow all the colours of the national flag are there in the picture.. I don't like the dress - hate the stiff fabric and the poor tailoring, not keen on the pattern over the middle either. The colour is lovely and Mathilde's smile and professionalism are wonderful.